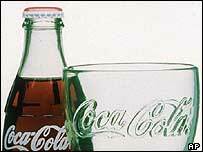 BBC NEWS | Business | Coke on the Rocks? Coca-Cola, the world's biggest brand, is in trouble. Its share price has halved over the last seven years as the company struggles to deal with the growing trend for new, healthier drinks. The company is under attack amid concerns about obesity and the effect fizzy soft drinks are having on our health. 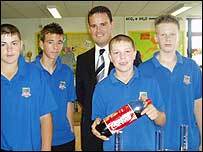 Mark Sexton, deputy head teacher at St Ilan School in Caerphilly, is someone Coca Cola should be worried about. He believes his students were downing far too much Coke for their own good. "I'd say the pupils were drinking, on average, about three cans a days," he says. "You'd be surprised at the number of pupils who were having cans at 7.30 or 8 o'clock in the morning." That level of consumption could amount to more than one and a half times a child's recommended daily sugar intake. Not surprisingly, Mr Sexton thinks it's bad for their health and bad for their education. "These drinks do induce some initial high levels of energy, which is sometimes accompanied by hyper activity or poor behaviour. "Then that's followed by a lull in energy levels, sometimes accompanied by poor concentration in the afternoons". Mr Sexton decided to act and joined the growing number of schools across Britain that have removed Coca Cola's fizzy drinks from their vending machines. Now, the politicians are putting the boot in too. Education Secretary Ruth Kelly and Scottish First Minister Jack McConnell have announced plans for a country wide ban on school vending machines selling fizzy drinks. It's not just in Britain that Coca Cola is being kicked out of schools. In Coke's own backyard, it's a similar story. The Terminator - Arnold Schwarzenegger, now Governor of California - is also taking on The Coca-Cola Company. He's recently passed legislation to ban the sale of all carbonated soft drinks in schools across California. That's been welcomed by parents like Jeannie Torrente from Sacramento, who feels her children should be encouraged to cut down on fizzy drinks. "I'm really pleased; I think it's a great thing," she says. "The world has been brought up on soda because we live in this fast paced world and I think we all drink way too much soda." That means the pressure is increasing on Coke to provide healthier alternatives to their carbonated drinks products, if they want to continue selling in schools. Unlike their arch rival Pepsi, Coca-Cola has been slow in diversifying into healthier products. Now they are playing catch up, trying to get a firm foothold in the booming juice market. This summer they launched Minute Maid, which will compete directly with Pepsi's market leading Tropicana. "Pepsi has a better business model," according to Tom Pirko, drinks industry consultant at BevMark. "Pepsi has been more successful because it is a food and beverage company. Coca Cola will eventually have to go there." Coke's sales are under threat in British universities too. Students are threatening to boycott Coca-Cola because of allegations surrounding some of their business operations in the third world. 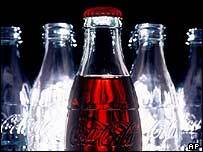 Open University Business Briefs: Is Coke losing it's fizz? Coke denies the allegations, but whatever they say, the adverse publicity and potential loss of the student market is bad news for the company. If that's not enough to take even more fizz out of Coke's sales, increasing concern about American foreign policy is putting some consumers off buying US goods. Instead they are opting for non-American drinks products. Confronted with all these challenges, Coke is going through a high stakes game. If they get it wrong, they risk losing out to their arch rival Pepsi, and becoming a "has-been" in the booming beverage market. Over the last few months they have met with some success, enjoying higher sales in developing markets, but not enough to bring the share price up to even half what it was in 1998. Says Mr Pirko: "this is a company fighting for its soul". The Money Programme - Coke on the Rocks? - BBC TWO at 7pm on Friday 18 November. Why is the British car industry in so much trouble today?